Best HVAC Maintenance Services in Pittsburgh | Schultheis Bros.
For over 70 years, our HVAC specialists at Schultheis Bros. Co. have been offering top of the line HVAC maintenance services in Pittsburgh. In fact, we were one of the first in Pittsburgh to offer HVAC services and have continued to grow due to our continuous improvement and our dedication to our customers and their specific needs. We built our reputation within the Pittsburgh area by operating with the highest levels of integrity. We understand how important it is to have your HVAC system running properly no matter what season it is. Our goal is to bring your system up to par and to improve the comfort and air quality in your home without breaking your budget or by trying to push unnecessary upgrades to your system. If you have any questions about our HVAC maintenance services in Pittsburgh and the surrounding areas, or if you would like to learn more about our other services such as roofing, feel free to give us a call today at 412-793-8000. You can also reach us by filling out the contact form located on this page and we will respond shortly. At Schultheis Bros, we provide 24-hour a day customer service. This includes 24-hour phone support, so you will never get an automated message when you call us and you will get answers when you need them the most. We also provide 24-hour repair service to ensure your HVAC system is always operating properly. 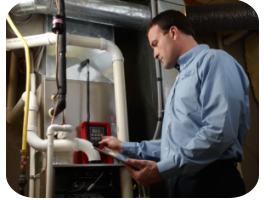 If and when your system does require maintenance, our skilled technicians have the experience and training to know how to properly diagnose, adjust, and repair your HVAC system so you stay comfortable all year long. To be on the safe side, you should never attempt to make repairs or changes on your own for warranty and safety reasons. To learn more about our HVAC maintenance services in Pittsburgh or if you have any questions pertaining to our other services, call us today at 412-793-8000. Or simply fill out the contact form on this page and we will reply promptly.